Prior to the arrival of the settlers, the Native American village of Celilo was the center of a flourishing trade network that stretched east and west from the Great Plains to the Pacific Coast, and north and south from what is now Alaska to California. The village was located in an area along the Columbia River, just east of The Dalles, Oregon. The modern-day reference to it being the “Wall Street of Indian Country” is very appropriate, not only given its significance as am an epicenter for trade but also because the people who lived there were all more or less wealthy by the standards at that time. 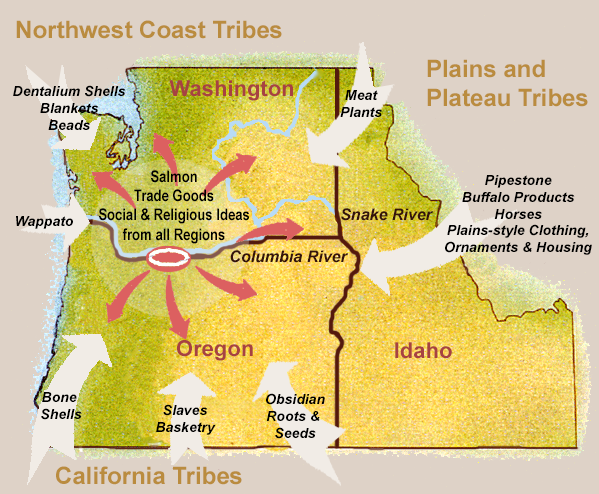 My ancestors fished at Celilo, which was then the epicenter for trade in North America. And, like everyone else who fished and lived there, they exchanged goods, cultural ideas and religious beliefs with people from many native traditions. My father’s people lived on the north side of the Big River (now the Columbia) in the village of Wishxam (also called Wishram) and had a Yakama heritage. My mother’s people lived on the south side in the village of Celilo (also called Wyam) and had both a Wasco and a Warm Springs heritage. People on both sides of the river fished, intermingled, and traded freely at that site, and were all more or less one people. They did not divide themselves according to the north or south sides of the river as people do today. And so today, families who may have been forced to live in the Warm Springs reservation, may have relatives who were forced to live on the Yakama reservation. Which brings to mind the fact that the notion of “tribes” as we think of them today never really existed until the settlers came, and until the reservations were formed … and the government felt that they needed to label people. It’s unfortunate that the labels they used had little to do with how the native people viewed their own boundaries and relationships with one another. But that’s another story for another time. And the inspiration for most of my art comes from Celilo and the areas surrounding it … areas that my ancestors called home, and an epicenter for trade.